New Delhi: Vice President of India, today, Venkaiah Naidu unveiled a Grand Wall Mural of Mahatma Gandhi at NDMC Headquarter Building in New Delhi. The 150 square meters clay mural is made of ‘Kulhads’ from the hands of 150 village potters across India, who assembled to make it at Morbi in Gujarat. 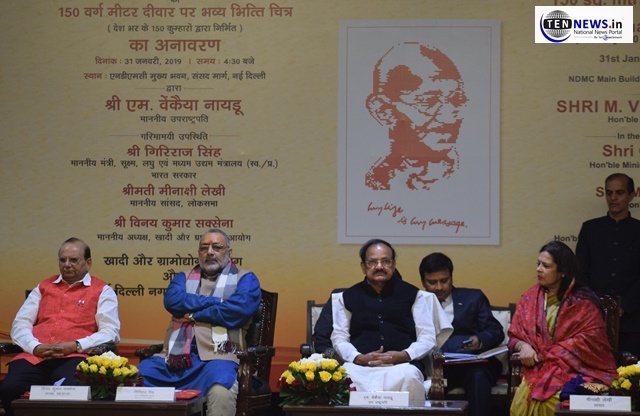 The Minister of Micro, Small and Medium Enterprises, Government of India, Giriraj Singh and Member of Parliament, Meenakshi Lekhi also graced the occasion.